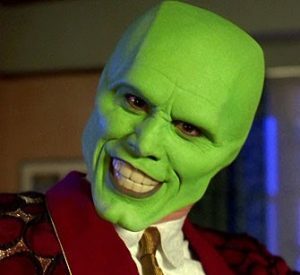 Every now and again, Jim Carrey gives an interview which causes people to wonder out loud, Is this guy playing with a full deck? Although Carrey may be passionate, he’s not stupid. Rather, he just doesn’t care what people think of him, and isn’t shy about being transparent. 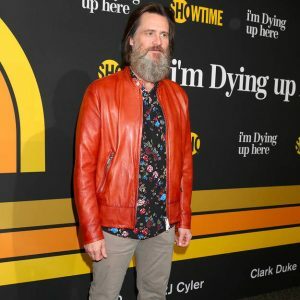 Carrey has publicly admitted to having struggled for years with depression, a condition which to his credit ultimately forced him to wean himself from Prozac and confront his demons without prescription or recreational drugs, alcohol, or even coffee. Instead, he turned to Transcendental Meditation and sought refuge in wide-ranging spiritual studies. Carrey’s chart has a number of remarkable features that single him out as a candidate for both depression and spiritual search. At a glance, the first thing that leaps out from his chart is the presence of six grahas in the Capricorn 4th house. Those familiar with yogas might immediately recognize Pravrajya Yoga, whose formation requires at least four real planets (not counting the nodes) in a single sign. In Carrey’s chart, he has five real planets in the 4th. 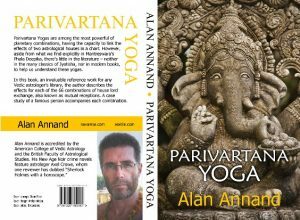 Pravrajya Yoga, among other things, inclines a person to embrace a spiritual search, which may include significant periods of withdrawal from the world, abstention from popular stimuli, and vows of silence, all in the name of sober contemplation and reflection upon the reality of existence. Although Pravrajya Yoga already suggests some degree of solitary withdrawal, its occurrence in Capricorn, including Saturn in its own sign, gives it an even greater bias. Furthermore, the theme of surrender is also strongly encouraged by the fact that the moksha houses of his chart (4th, 8th, 12th) are very much activated. A general technique to assess how strongly any of the purushartha themes (goals of a person) are activated in any chart is to examine the lords of dharma houses (1-5-9), artha houses (2-6-10), kama houses (3-7-11) and moksha houses (4-8-12). For example, when two or more dharma lords occupy dharma houses, the dharma theme is activated in the life, all the more so if one or more of those lords is strong. And so on with each of the other triads – artha, kama, and moksha. In Carrey’s case, let’s examine the moksha triad. The 4th lord is Saturn, strong in its own sign. The 8th lord is Venus, also in the 4th, where it gains dig bala. The 12th lord is Mercury, also in the 4th, where it suffers injury via graha yuddha with Jupiter. The key observation here is that all three moksha lords (Saturn, Venus, Mercury) occupy a moksha house (the 4th) where two of them enjoy strength. This immediately highlights the moksha theme, all the more so since these three lords all occupy Capricorn, the sign of Saturn, the great renunciate. In the scheme of Vedic psychology, the concept of the manas is intended to cover the “emotional” mind, that instinctual part of our brain that manages the autonomic nervous system, registers likes and dislikes via the five senses, and thus forms part of our personality. When the manas is disturbed, the person may become prone to physical and/or emotional irregularities. The manas is analyzed via the 4th lord, the 4th house, and the Moon, which is the karaka for the emotional mind. Disturbance arises when planets are weak, badly placed by house, or influenced by Saturn or the nodes. Allowance is made, however, for when Saturn is itself the lord of the 4th. First, we examine the lord of the 4th house. Since Saturn is the 4th lord (as it will be for every Libra and Scorpio ascendant), there is no bias against it for that reason alone. However, it is in mixed condition – occupying its own sign but widely combust with the Sun. Next, we examine the 4th house itself. As above, there’s no harm in having Saturn the 4th lord in the 4th house, but the fact that it is associated with Ketu does signal some disturbance of the manas. Finally, we examine the Moon, which is the karaka for the manas. The Moon is badly placed in the 8th house, although it is exalted and aspected only by benefic Jupiter. On the basis of this analysis, we can only say, this signifies mild disturbance at worst, but nothing seriously threatening. So he may suffer depression (Saturn brings him down) but it doesn’t make him crazy. Closer examination of the 4th house reveals more stuff going on. Lagnesh Venus is also combust in the 4th. Jupiter is debilitated, and suffers graha yuddha with Mercury. Again, some disturbance, but not disastrous for the manas. 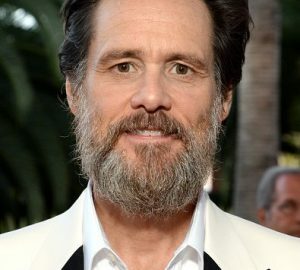 So we could say, Carrey has a troubled psyche, but he’s able to summon enough coping mechanisms (diet, meditation) to stay on a more-or-less even keel. Currently he’s running Saturn dasha. As noted earlier, Saturn is in mixed condition (own sign but combust), owns two positive houses and occupies one of them. But Saturn also generates results for its nakshatra lord Sun, which both owns and occupies a positive house under the influence of both benefics and malefics. All things considered, pretty positive. Looking ahead to Mercury dasha, however, his circumstances are subject to change. Mercury is in graha yuddha with Jupiter and, because Jupiter is the brighter, Mercury will effectively be the “loser” who gets eclipsed. Mercury is the lord of the 9th (spirituality, guru) and 12th (loss, disappearance) although, because of Mercury’s 4th house position as noted earlier, the moksha theme will predominate. Since Mercury dasha will also deliver results for its star-lord, we must therefore look to the Moon. Since the Moon is 10th lord in the 8th, we can anticipate career or social setbacks, perhaps nothing terribly serious since the Moon is strong and supported by at least that mixed-condition Jupiter. 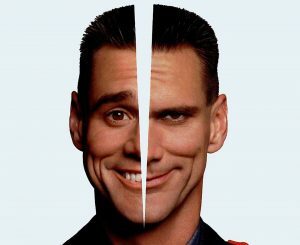 Thus our narrative might be that Carrey’s career moves to the back burner, in an on-again/off-again pattern within which he periodically withdraws from the material world and the actor surrenders to the role of a lifetime, the sadhu within.